The energy is based on the natural phenomenon osmosis, defined as being the transport of water through a semi-permeable membrane. This is how plants can absorb moisture through their leaves – and retain it. When fresh water meets salt water, for instance where a river runs into the sea, enormous amounts of energy are released. This energy can be utilized for the generation of power through osmosis. 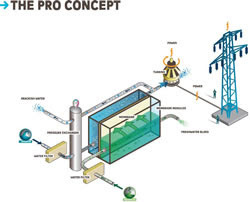 At the osmotic power plant, fresh water and salt water are guided into separate chambers, divided by an artificial membrane. The salt molecules in the sea water pulls the freshwater through the membrane, increasing the pressure on the sea water side. The pressure equals a 120 metre water column, or a significant waterfall, and be utilized in a power generating turbine. Stirling-Dish Systems are small power generation sets which generate electricity by using direct solar radiation. The capacity of a single unit is typically between 5 and 25 (50) kWel. This size and the modularity of the single units qualifies the Stirling-Dish system for very flexible applications. 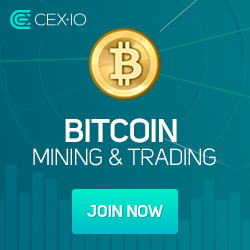 They are ideal for stand-alone or other decentralised applications. In clusters with a capacity of up to 10 MW, Stirling-Dish systems can even meet moderate-scale grid-connected demands. The parabolic concentrator reflects the incoming solar radiation onto a cavity receiver which is located at the concentrator’s focal point. The solar radiation is absorbed by the heat exchanger (receiver) and thus heats the working gas (helium or hydrogen) of the Stirling engine to temperatures of about 650oC. This heat is converted into mechanical energy by the Stirling engine. An electrical generator, directly connected to the crankshaft of the engine, converts the mechanical energy into electricity (AC). 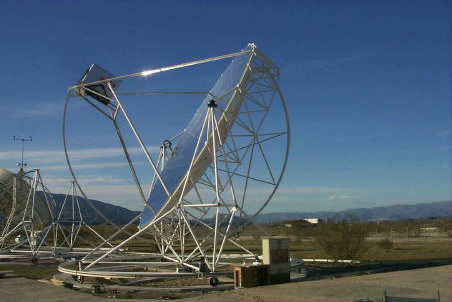 To constantly keep the reflected radiation at the focal point during the day, a sun-tracking system rotates the solar concentrator continuously about two axes to follow the daily path of the sun. The electrical output of the system is proportional to the size of the reflector, its optical performance and the efficiencies of the Stirling engine and the generator. Currently, about 1.5 billion people in developing countries lack access to electricity and about 3 billion people rely on solid fuels for cooking. In sub-Saharan Africa, the number of people without access to electricity and modern fuels is similar (respectively 560 and 625 million people). In Asian regions, while people may have access to electricity, they often lack access to modern fuels. In East Asia and Pacific, less than 200 million people lack electricity access, but almost 1.1 billion people rely on solid fuels for cooking. The attention of the global energy access situation report highlights that three billion people still rely on traditional biomass and coal; with a striking two million deaths per year associated with indoor burning of these solid fuels in unventilated kitchens. Almost two billion people need modern energy services by 2015 to accelerate Millennium Development Goal's achievement. Greater broad-based eﬀorts are needed to expand access to modern energy services to those who lack access, especially to heat for cooking and to mechanical power in rural and remote areas. Unless massive eﬀorts are made to expand the range, quality, and quantity of energy services available to the poor, countries are unlikely to achieve their development aspirations. A quick look at the maximum power point tracking (MPPT) and micro-inverter markets. Demand for solar energy could be down as much as 17% on the year for 2009. This is the stark reality the industry is facing as it slowly emerges from the recession that has caused demand for energy across the world to drop for the first time in a half-century. While this may put a damper on power industry growth in the short-term, long-term energy demand worldwide is expected to double by 2050 and with concerns about climate change on the rise, the prospects for the solar power industry remain bright. 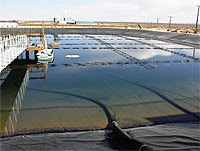 Algae can grow practically anywhere, thus ensuring that there is no competition with food crops. Algae are excellent bioremediation agents - they have the potential to absorb massive amounts of CO2 and can play an important role in sewage and wastewater treatment. Algae are the only feedstock that have the potential to completely replace world's consumption of transportation fuels. More than 550 high-level political decision makers at EU, national and regional level, representatives of the renewable energy industry, NGOs and scientists gathered in Brussels for the 3rd European Renewable Energy Policy Conference, organized by EREC as an official event of the Swedish EU Presidency. The conference showed a broad consensus that renewable energy will be the mainstream source of Europe's energy supply by 2050. A Solar Pond is a large shallow highly saline body of water. 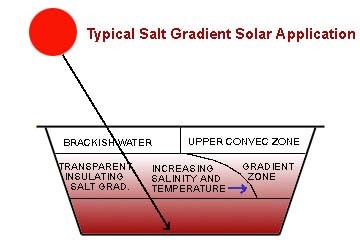 The salinity gradient actually traps the heat from the sun in the bottom layer. The temperature can get up to 100 C! Whilst the upper layers act as a form of insulation, this means that the heat is retained overnight. In practice this heat can be used for a wide range of applications for a great many industries by various forms of heat exchanger systems within the bottom layer of the pond. Alternatively the lower layer of water can be pumped out and replaced at the top. The generation of electrical power can be done by introducing further heat exchanges and turbines into the mix. As the water is not particulaly hot for electrical generation other means of improving the temperature gradient can be utilised to keep the generation fairly constant. Like any system energy in has to equal energy out. Therefore if you extract too much energy the system can collapse. However with careful monitoring this can be avoided. Sun Earth Energy are proposing a pilot plant to initiate a larger Solar Pond developement right now. As the salt content of the water is the most crucial factor the locations are best next to the ocean, and even then 12 months of evaporation is needed to get to the required salinity content (about 500kg of salt for every square meter of surface)! Wish us luck. The initial generation capacity will have a peak 5MW and the full cluster configuration will generate a peak 30MW. Not bad for just a boring stretch of water. And by the way one of the principle directors of Sun Earth Energy did his PhD in 1991 on the computer modelling of solar ponds. And like all over-night success stories - there is some considerable history behind it!